Qatar is one of the fastest developing countries in the Middle East. Over the last two decades it has become one of the most advanced countries in the world thanks to its rigorous selection of foreign talents which have shaped its public and private infrastructures. This has made it a hot destination for skilled workers around the world from all fields. Canada is one of the many countries which Qatar looks to when selecting their growing workforce. This is no surprise as Canada is home to some of the most prestigious universities in the world, especially in fields such as engineering and education which are always in demand in Qatar. These include the University of Toronto, University of British Colombia, McGill University, McMaster University, University of Concordia, University of Alberta, Queen’s University, University of Waterloo, University of Western Ontario, York University, and the University of Ottawa. The relationship which has developed and continues to grow between our two countries has resulted in quite a bit of paperwork between them. From Canadian Degrees, Transcripts, Police Checks, Birth Certificates, Powers of Attorney, and Fingerprint forms to Certificate of Pharmaceutical Products, International Trade Certificates, and Good Manufacturing Practice Certificates, thousands of documents are exchanged between both countries every year. Before documents issued in Canada can be accepted in Qatar they have to go through a process of validation. This is known as attestation in Qatar and as an apostille in many other countries. However, Canada never signed the Hague apostille convention and does not use attestation or apostille. Instead, Canadian documents require an alternative process that is equal to attestation and apostille. This validation process is known as authentication and legalization. We are the pioneers of authentication and legalization services in Canada. Since our beginning over 25 years ago we have helped thousands of our clients with their affairs in Qatar. As a result, we have built a strong relationship with the consular staff at the Embassy of Qatar here in Ottawa and are recognized by both the embassy and Global Affairs Canada as reliable, trustworthy service provider. In short, we always get it right. In fact, it’s our service guarantee: we ensure that your documents are properly authenticated and legalized for use in Qatar. We are experts on virtually every Canadian document for use in Qatar such as Birth Certificate, Marriage Certificate, Death Certificate, Power of Attorney, University Degrees, Diplomas, Transcripts, Letters of Confirmation, Police Criminal Record Check, and Fingerprint Forms. Every day we help dozens of our clients with their affairs in Qatar, whether its for purposes of employment, marriage, inheritance, or sale of property. Often, our clients are rushing to meet a deadline and are frustrated, stressed, and confused by the various requirements that need to be met for the authentication and legalization of their Canadian document for use in Qatar. Authentication at Global Affairs Canada can take as long as 20 business days. This is on top of the processing times at the embassy of Qatar which can vary. This can quickly add up to months of waiting which is simply not an option in many cases. On our priority service we can have your documents authenticated at Global Affairs Canada on the same day they arrive in our office and legalized by the consulate of the Embassy of Qatar here in Ottawa shortly afterwards. Our processing speed coupled with our service guarantee means your Canadian documents are ready for use in Qatar in no time and with no stress. We can ship them anywhere in the world through our trusted shipping partners upon completion including to Qatar by FedEx. Our professional team at ALSC will keep you updated at every stage until your documents are where they need to be. If you are currently rushing to meet an approaching deadline, we recommend you contact us immediately for a free quote. While you wait, continue reading for additional information on various Canadian documents for use in Qatar and how we can help you. Since Qatar is an attractive work destination, there are some who try to attain employment by providing fake degrees and related documents. To combat this, the Qatari government has very strict requirements and procedures for Canadian educational documents for use in Qatar. Along with the appropriate fees, payment, and original degrees, transcripts, and letters of confirmation of graduation, you will have to contact the university which issued your degree and instruct them to send additional materials directly to the embassy. Without these materials, your educational documents will not be accepted for legalization. Before doing anything however, we recommend you know the dimensions of your degree. This will be crucial to know for shipping purposes regardless of if you choose to use our services or not. Furthermore, the embassy of Qatar only accepts original degrees and educational documents. Please note that this can make it difficult to keep large degrees in mint condition as they are prone to mild damage during legalization at the Embassy of Qatar. At ALSC we do everything we can to prevent this and have special envelopes for large degrees and documents to ensure minimal damage. We also have special shipping envelopes for large degrees and documents for all our clients regardless of the service speed they choose. If you do not currently have your degree or if it is damaged, you may be able to order a duplicate original from the issuing university for a fee. If you need to do this we recommend you have the degree shipped directly to our office to save you even more time, especially if you are currently located outside of Canada. This is because it is very likely we can complete authentication and legalization of your degree in the time it would take for it to be sent to you overseas to check. We know exactly what to look for; you can trust us! Find out if you can order a new degree if yours has been lost or damaged using the links below. Another one of the documents that will likely be requested from you for purposes of work or immigration is a Canadian Police Criminal Record Check or background check. RCMP checks are the go-to police checks in Canada. The Royal Canadian Mounted Police carry a global reputation akin to institutions such as the FBI, CIA and Interpol. As a result, they are an authority trusted by the Qatari government and its officials. Furthermore, the signatures on police checks and other documents issued by the RCMP headquarters in Ottawa are recognized by Global Affairs Canada. This means that they do not require notarization and are ready for authentication. If you do not currently have your RCMP check, it is easy to get and can be ordered by clicking here. If you need your RCMP police check authenticated and notarized for use in Qatar, we suggest you have it mailed directly to our office when you order it. The RCMP head office is located minutes away from our ALSC head office here in Ottawa. This means that we can receive your RCMP check and have it authenticated faster than the time it would take for it to be delivered to you if you live outside of Ottawa, and especially if you are currently located outside of Canada. Remember that upon completion we can ship your RCMP check anywhere in the world including Qatar with one of our shipping partners. You can also pick up your authenticated and legalized RCMP check at one of our service center locations near you. RCMP checks are not the only police checks available in Canada. There are hundreds of local police checks that can be issued by police departments at the local level. However, these police checks are not always accepted in Qatar. RCMP checks are considered the standard and anything less is open to potential forgery. Locally issued police checks require the stamp and signature of a notary public or lawyer before authentication at Global Affairs Canada. The Qatar embassy will have no issues legalizing a locally issued police check but the requesting party in Qatar may not accept your locally issued police check. As such, it is crucial that you check with the requesting party in Qatar whether a locally issued police check will suffice. 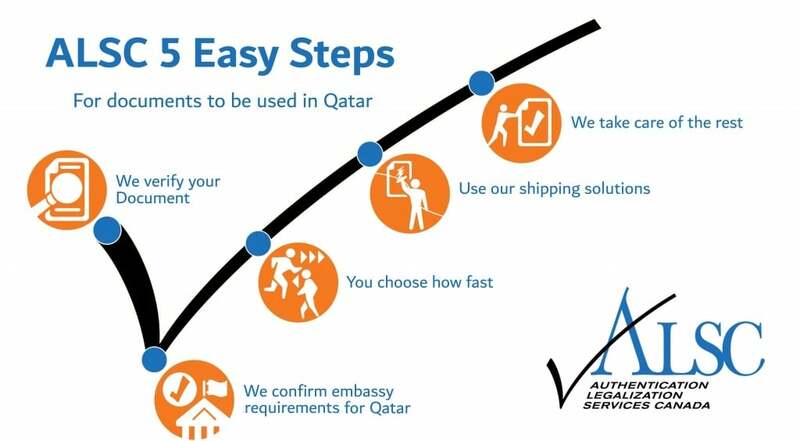 Although we guarantee proper authentication and legalization for use in Qatar, we cannot guarantee that the requesting party will accept your documents, so make sure you have what you need. Another document which may be required along with a police check are fingerprint forms. Also, Canadian fingerprint forms are often required to obtain a police check in Qatar. If you are planning on having someone else obtain your police check for you in Qatar, keep in mind that you will also need a power of attorney authenticated and legalized for use in Qatar. If you do not have a power of attorney, it is easy to have one drafted by a lawyer for you. They will also notarize it which will make it ready for authentication and legalization. Fingerprint forms can be obtained from the RCMP. Here is more information about using a Canadian Police Criminal Record Check in Qatar or anywhere else in the world. Canadian vital statistics documents such as birth certificate, marriage certificate, and death certificate may also be required for use in Qatar. These are commonly requested for things such citizenship or pension, to bring your children or spouse with you to Qatar, and to claim inheritance or resolve other matters related to the loss of a loved one. Despite being the most important documents that can be issued, Canadian vital statistics documents are not often used within Canada. As a result, it is common that they get lost or become damaged over time. If you need to obtain a Canadian birth certificate, marriage certificate, or death certificate for use in Qatar you will have to contact the provincial vital statistics department of the province in which that event occurred. Thankfully, Canadian vital statistics documents are some of the easiest to process. They have minimal requirements at Global Affairs Canada and the Embassy of Qatar. The primary thing to remember is that wallet-sized certificates will not be accepted by Global Affairs Canada or the Qatari embassy. Notarized copies can be made but are not required since the signatures on Canadian vital statistics documents are recognized by Global Affairs Canada and can therefore be authenticated without additional procedure. Notarized copies are also not always accepted in Qatar; always remember to double check with the requesting party. It is also in many cases cheaper to order a new vital statistics document than to have a notarized copy made. If you need to order your Canadian vital statistics document, we recommend, as with RCMP checks, that you have your Canadian vital statistics document ordered directly to our office to save you even more time. You can do this by using the links below. At ALSC, we are always raising the bar for ourselves. Being recognized and well known by Global Affairs Canada and almost every embassy in Ottawa allows us to extend a higher quality of service to our clients. Furthermore, when you use our services you have the option of saving yourself money and a trip to the post office saving you $70-$80. When you use our service centers, your documents are given free priority FedEx shipping to our head office in Ottawa for processing, and free FedEx shipping on return to the service center for you to pick up upon completion. We have service centers all across Canada: Vancouver, Victoria, Surrey, Calgary, Edmonton, Regina, Winnipeg, Toronto, North York, Mississauga, Halifax, and Montreal to make the easier for you. Keep in mind you the first step is to contact our Ottawa head office to make an appointment. Also before getting started we strongly recommend you confirm exactly which documents you will need with the requesting party in Qatar. The good news is that regardless of what Canadian document they may need from you, we should be able to help. We know that trusting a third party with your valuable and often confidential documents can be difficult. Our membership with the Canadian Chamber of Commerce and our A+ rating with the Better Business Bureau prove that we are a trustworthy business concerned with nothing but providing the highest quality service to our clients. When you use ALSC, you can rest assured knowing your affairs are in the best hands of the industry, as our numerous testimonials show. Let us save you time, stress, and money in the long run. 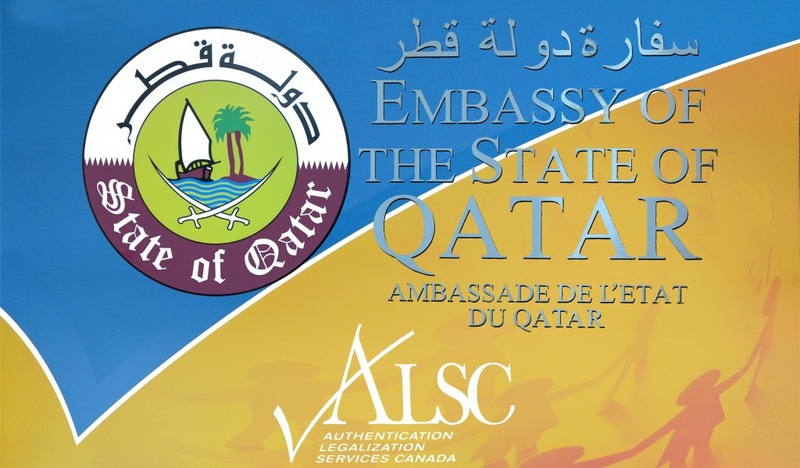 Click below to get started with the leaders of authentication and legalization in Qatar.